Perhaps it is because I wish that I were in Thailand right now, participating in person in one of these manuscript studies, or perhaps it is simply that by ‘giving up travel’ for Lent I’ve actually got the time to dedicate to it, but either way, here goes, Mark manuscript study, Day 1. The first thing you will need, if you’d like to join me (and, by the way, if you are the LAST person in the world who would ever do something called ‘Bible study’ then you are most definitely the FIRST person I’d invite to contribute–part of what has made these studies so rich for me in the past is the variety of people, from so many backgrounds, that have offered their observations, thoughts, and insights)…where was I? Oh yeah, the first thing you will need is a pdf of the Mark text. I’d recommend printing it out–it will be 43 pages, so be prepared. The pdf of the Mark text that I’ve posted at that link already has the appropriate line and page numbers for easy reference. This method depends on using the same line/page numbering technique. So, on page 1, what do you notice? What do you see? What is the gospel (according to page 1!)? What words or phrases are repeated? What is confusing? What is intriguing? Pretend that you are Book of Mark CSI and pay attention to clues, hints, and random stuff that makes you wonder why the author included it. From a methodological perspective, it can be helpful, or at least colorful, to use the same color to denote certain things. Use colored pencils or pens, whichever you prefer. Write all over the text–that’s what it is there for. So, if you see a word repeated, use the same color, or circle it, or do something to mark it. Or a certain phrase, or perhaps when you are given the location, or the time of day. After the 30 minutes is up then we’d share what we observed with a group of 6-8 people around a table, taking turns to hear what one another observed, wondered, noticed. After a while of discussing around tables, we’d then open the conversation up to the larger group (usually about 25-30 in a larger group) and see what played out. Obviously, in this context, that is a bit impossible. So, feel free to simply eavesdrop and read along, or even better, contribute a thought or two. Just a note on etiquette: it is essential in this type of study that all voices are allowed to contribute, that no one is belittled or shamed for a perspective, and that common courtesy is practiced. It doesn’t mean folks can’t disagree, but it does mean that it must be done in a manner that is respectful. It’s unfortunate, but often the most ‘religious’ of us are the worst offenders in terms of how we treat those with whom we disagree. Let’s give that up for Lent too. I first came upon the concept of ‘manuscript study’ in Bangkok, Thailand. I realize, a form of studying the Bible is not necessarily the first thing that comes to mind when you think of Bangkok. Nor the second. Nor the third. And yes I did partake of much that Bangkok has to offer–amazing Thai massage, beautiful Buddha statues in temples, and of course green curry, tom yum, and pad Thai with incredible flavor and dirt cheap. No, I did not partake in the ‘other’ side of Bangkok, but I did go on a tour of the red light district with an organization called Night Light that seeks to rescue women from sexual slavery and exploitation. But more on that later. Back to manuscript study. I was blown away by it from my first encounter. Why? I’m not entirely sure, but each of the three times I’ve participated in this week-long event, it has been incredibly rich. I’ve tried to describe it a few times, including an article I wrote for Princeton Seminary called ‘Wonder Bread.‘ I wrote about it again after my experience with it four years later. The format is part of it–take the study away from those paper thin pages in that leather-bound book and it can help to make it more accessible, or at least easier to write all over it without feeling guilty for ‘messing it up.’ With no chapters and verses there are no arbitrary stopping or starting points, and the story itself is allowed to dictate where one section ends and another begins. But more than the format is the style in which the manuscript is studied. I’ve grown up in the church, so I’ve been a part of many Bible Studies, some better than others. What often seems to happen is that the text can be used as a springboard for something else. So, instead of studying Mark, we actually bring in Ephesians or Acts or Revelation, none of which are bad, necessarily, but they are not Mark. In the method of manuscript study (mss) one is forced to stay with the text at hand. The two main questions, in this format, are ‘What do you see?’ and ‘Where do you see it?’ This, again, helps the study to stay focused within the text in question, and to try to curb the tendency amongst some to leave the text behind and pontificate on a topic of choice. It can feel limiting at first. It can be frustrating. It can feel slow. So, since I can’t make it to Thailand this year I’ve decided that I’m going to attempt a blog version of a Mark study. Will it work? Don’t know, I’ve never tried it before. Seems like it’s worth a shot. Today was the final day of our conference. There are many elements to it, but the central one is surround manuscript study. Basically, manuscript study takes a book of the Bible, printing it out with no chapters, verses, or paragraphs, adding line numbers and page numbers. 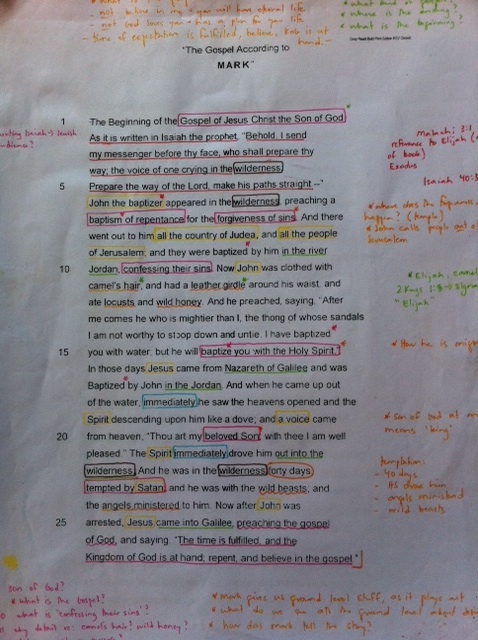 I was in a group studying the second half of the book of Mark. Each day we would meet together, about five smaller groups of 4-5 people each, around tables. The day would begin with individual study of a particular section (page 15, line 5 to page 16, line 24, for instance) asking two questions: what do you see and where do you see it. We used colored pencils to circle, underline, scribble, write or draw whatever seemed significant. Then, after a time, we would discuss in the smaller groups, again asking, what did you see and where did you see it. Finally, the larger group as a whole then discusses, what did you see, where did you see it. The attempt, in limiting discussion to those two questions, is to keep it from turning into either sweeping generalizations (God says we must say the sinner’s prayer to go to heaven when we die—where do you find that, actually?) as well as preventing us from saying, ‘Well, the book of John says…’ We are in Mark. What does Mark say? How do we understand that, taken for what it is, not what we have turned it into? When I came to the conference four years ago one of the highlights, other than meeting people from all over the world, was this method of study. I had never before so loved studying the Bible as I did for that week. All day, everyday, for five days straight, and it never got old. I wrote an article about it, Wonder Bread, if you are interested. I’m not sure how to replicate this kind of study in a regular, ongoing basis, but I’d love to try and figure it out.